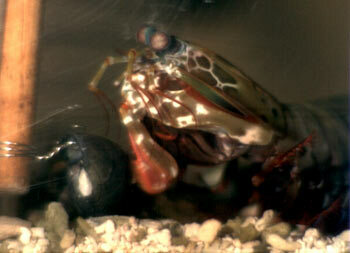 Mantis shrimps are mere inches long but can throw the fastest punch of any animal. They strike with the force of a rifle bullet and can shatter aquarium glass and crab shells alike. Now with the aid of super-speed cameras, we are beginning to truly appreciate how powerful this animal is. When Sheila Patek, a researcher at USC Berkeley, tried to study these heavy-hitters on video, she hit a snag. “None of our high speed video systems were fast enough to capture the movement accurately” she explained. Some scientists think that the mantis shrimps’ belligerent nature evolved because the rock crevices they inhabit are fiercely contested. This competition has also made these animals smarter than the average shrimp. They are the only invertebrates that can recognise other individuals of their species and can remember if the outcome of a fight against a rival for up to a month. And recently, Roy Caldwell, also from USC Berkeley, discovered that mantis shrimps have the most sophisticated eyes of any animal. While human eyes only have a measly three kinds of light receptors, mantis shrimps have at least ten, allowing them to see into the infrared and ultraviolet range. One can only guess if these animals have other record-breaking adaptations that are yet to be discovered. Maybe USC Berkeley exists in my fevered imagination? Eh? Eh? How does a punch lower the water pressure? Are you sure you aren’t seeing triboluminescence?